Perfume sample and perfume decant, other people make them for swapping and travel, and you want to do the same! Here’s all of the information on h ow to make a perfume sample and perfume decant, what decant supplies you need and where to get those decant supplies! Those of you that already decant wildly for your friends or do bottle splits, etc., you get the day off today, or you can just add your own favorite suppliers and tips in the comments. Funnels and Bulb Syringes (Xanax is optional) If you are a klutz or nervous or both, you’ll definitely want funnels and bulb syringes and a Xanax, though the bulb syringes are of minimal use for most perfumes because they are sprays where you cannot remove the sprayer. Xanax is helpful all the time for most stress life hands you. The biggest single problem in perfume decanting supplies is that you need to order a good number of bottles/vials at one time or suppliers will kill you on shipping and/or price. So if you’re ordering just a few, be prepared to pay for it. But if you only need a few, paying for a quantity that you can’t use or don’t need is ridiculous. It’s far cheaper to buy a few if you know you won’t use up a lot of them than to buy cases that you will never use. Madinaonline.com is great for a sample vial, and you can order them in not huge quantities. You’ll get killed on postage if you only order 100, but if you know you’ll decant enough over the next many years to justify a tray for $80 or so, that’s your best bet. In defense of the suppliers, shipping glass gets expensive fast. Madina also has good 5 ml glass roll-on bottles for a large perfume sample as well as splash bottles. Best Bottles also has great bottles at a good price, and it looks like they’ve now got some 10 ml spray atomizers too. I’m not crazy fond of those plastic atomizers either, but they can work well enough, just be careful of cloggage and spray some hot water through them if that happens. SKS Bottle has some great 3 ml, 5 ml, 10 ml glass bottles with sprayers. You have to order 48 at a time, but that’s probably worth it if you plan to do any decanting at all. Plastic atomizers, I won’t use them for long-term storage and since I never know what will be long-term, I just don’t use them. If you think you want to keep that perfume sample around for a while, transfer it to glass. If it’s a short little trial thing, maybe just needing it for a month or so, plastic is fine. Accessories for Fragrances has great plastic atomizers, funnels and amazing customer service. Larger spray bottles, 15 ml and 30 ml, right now SKS has some good 30 ml bottles, and you’ll probably need to go to Madina for the 15 ml bottles. I am not a huge fan of the Madina bottles, they can be prone to leakage, at least some models of them. I’d rather use the SKS and fill it half full..
Funnels and syringes, again, go back to Accessories for Fragrance, who has all of that sort of thing and has little perfume sample and perfume decant kits, which are a great place to start for supplies for your first decanting experience. As you start pricing things, you’ll get some idea of how expensive this perfume sample making and perfume decanting thing is. Anyone who does/has done a lot of decanting or bottle splits will tell you how labor intensive it is and how much supplies will wind up running you, not to mention overspray loss from a bottle. So if you are thinking of doing bottle splits, factor in about 5-10 ml or more (some bottle sprayers are horrible for overspray and will have higher loss) per bottle loss of juice. There is nothing worse than doing a bottle split, and you get down to what’s left for you, and you don’t have enough juice to fill your own part of the split. Factor in potential spillage, all the decanting supplies, shipping, etc. Make sure you know what size the bottle is for sure – you don’t want to short someone or wind up giving away 20% of the split. I keep using the same ones over and over because once I’ve measured them, I don’t want to do it again. For just swapping, this isn’t a big deal, but for bottle splits, it can become a big deal fast. Labeling. You want to get a label on the perfume sample bottle/vial that won’t smudge, should stay on pretty well, and will stand the test of time. Skimp somewhere else, but if you plan on doing any perfume sharing with friends, love them enough to provide them with a good label. This is Patty Pet Peeve territory, so just ignore the amount of peevish that permeates the post. A lot of people have a perfume samples or decant around for years, and there is nothing more frustrating than having a label you can’t read on a perfume sample that you fall in love with. Anything missing a label or that is smudged, I throw away immediately. Who needs that heartbreak? You can pick up a manual – Brother Personal Labeler Machine – labeler for less than $30. It may be manual and take some time to make each label, but it is well worth it. If you plan to be doing a lot of swapping and sharing, invest in one that connects to your computer so you can store labels, one of the desktop models – Brother PC Connectable Labeling System (PT2730) – for a little over $60. You can get the Brother P touch labels there as well, which runs about $10-15 per cartridge, which is far less than the $20 that OfficeMax charges. The bonus, you’ll be thrilled having a little labeler around to label everything else with. Trust me, your labeler will wind up being one of your favorite ancillary tools that you never knew you needed. So make the label and put it on the size container you are decanting. Filling the bottle. This is where the nervous get more nervous. You want to practice this first! Use a spray bottle filled with something you don’t care about, like water. Very few perfume bottles conveniently unscrew so you can just pour them, more often they are sprays, so you have to get that spraying from one bottle into another down. If it’s a pour bottle, then life is super-easy! Grab a little funnel or one of those bulb syringes, if you need it (not me, I go commando), and then either pour into the funnel once you place it on the decant bottle (be careful that you can hold it so it doesn’t tip over if it’s a small bottle) or extract the perfume with the syringe. Then put the cap on and the label. For sprayers that are not removable, you have to spray from the perfume bottle into the vial or decant bottle. For vials, you’ll have more problems with overspray than anything else, and I don’t recommend a funnel here, it will just make a mess. Feel around on the vial for the open end, line it up with the the hole on the sprayer for the perfume bottle, and gently squeeze in enough perfume to fill it without overfilling, and then snap the cap on it. As easy as that sounds, snapping that cap in firmly on the perfume sample vial the first few times will give you a heart attack as you’re sure you will crush/snap the vial in two. Just push, you have to, or it won’t go in. I’ve snapped on hundreds of thousands of these, and I’ve had maybe five break over the last three years from just putting in the cap. For filling a larger bottle, this is the point where a funnel can be of some help to catch the overspray. If you don’t buy one, you can use some aluminum foil shaped as a funnel. Just fill the bottle, then put on the lid/roll-on cap. Securing the bottle. If you are sending more than one perfume sample at one time, and if one of them happens to be something particularly raunchy, think about putting it in its own teeny zip-lock bag (available at Uline.com). 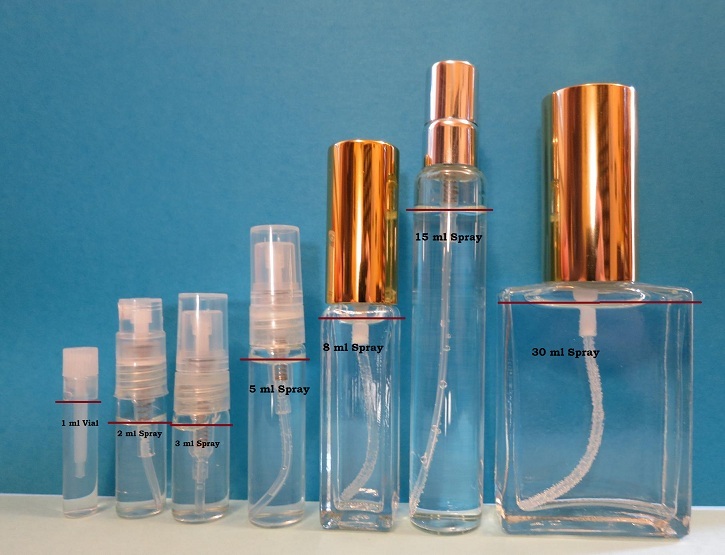 For perfume decant bottles, the larger ones especially, make sure to take a bit of electrical tape and wrap it where the bottle cap meets the bottle. This will keep the cap on and prevent almost all of the jiggling that sometimes occurs in transit that can cause bottles to leak. Mailing. I use a padded envelope and some bubble wrap or peanuts (save this and envelopes from other swaps you get over time! ), which works well for sample vials and a few smaller decants. I’ve been using them for years to ship, and have had almost no breakage. Hope this helps you all figure out how to make a perfume sample or perfume decant of your very own! If you have to ask , then google “clueless”. Omg, I laughed so hard at this!